Heeft u een vraag voor Cassiopeia Hotel? Het Cassiopeia Hotel in Inle Lake ligt op een gunstige locatie voor reizigers met een interesse in religieuze interesse, cultuur, bezichtiging van bezienswaardigheden en is bij uitstek geschikt om te ontsnappen aan de hectiek van alledag. Gelegen op 0.2 km van het hart van de stad, bevindt dit 3-sterren hotel zich op een excellente locatie met de grootste attracties binnen handbereik. Dankzij de praktische locatie liggen alle belangrijke trekpleisters in de buurt van het hotel. De faciliteiten en diensten, geboden door het Cassiopeia Hotel, garanderen een plezierig verblijf voor gasten. Het hotel heeft een uitgebreid aanbod aan services, inclusief 24-uur roomservice, gratis wi-fi in alle kamers, dagelijkse schoonmaak, taxi service, ticket service. Het Cassiopeia Hotel beschikt over 20 kamers, allemaal smaakvol ingericht voor optimaal comfort, met voorzieningen als thee, kledingkast, handdoeken, slippers, oploskoffie. Het hotel biedt geweldige recreatiemogelijkheden die uw verblijf onvergetelijk zullen maken, zoals tuin. 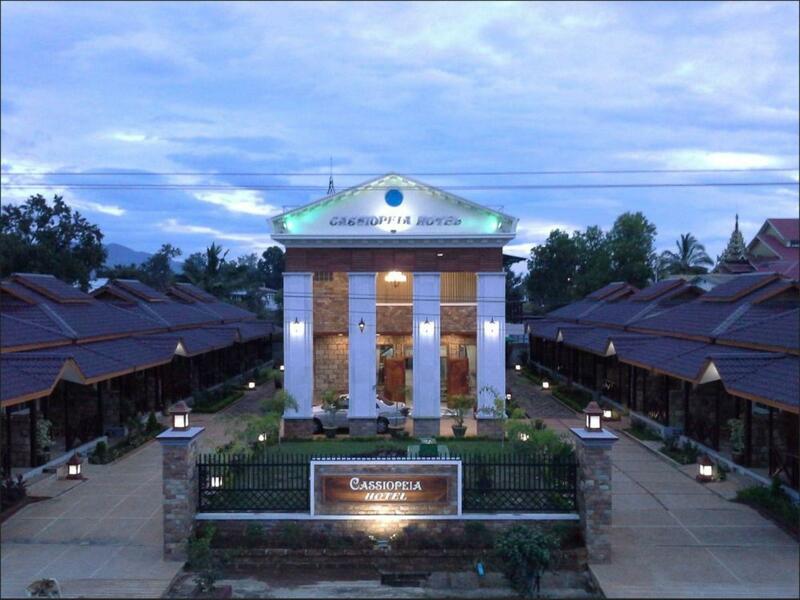 Wat de reden van uw bezoek ook is, het Cassiopeia Hotel is een uitstekende keuze voor uw verblijf in Inle Lake. Hotel is goed. De kamers zijn ruim en de regendouche is prettig. Ontbijt is goed en ruim. Personeel is vriendelijk en behulpzaam. Het cassiopeia hotel nieuwe, goed ingerichte bungalows, met een prima ontbijt. Zeer behulpzame staf. Dichtbij de bezienswaardigheden van het Inle meer. Boottrip geregeld door de manager. Op loopafstand van leuke kleine restaurantjes. Kortom een aanrader. Arrived in Nyaung Shwe approximately 7am on a JJ VIP express bus from Yangon and was able to check in. Not only that, we were given breakfast which we were not entitled to and much appreciated. Stayed 5 nights at this lovely little hotel in a Bungalow but too long for Nyaung Shwe. The only complaint will be the shower had no pressure and it wasn't hot enough. No kettle in the room,thermos only, but will bring you fresh thermos on request at anytime of the day.The local food served for breakfast was often Luke warm to cold and need to improve. Breakfast usually consist of local food, eggs, fruit,toast and banana pancake. More than enough to keep you going till dinner time. Tin Maung was very helpful with our tours and always willing to help us with whatever our needs are, nothing is too hard. Would definitely recommend this hotel but 2 to 3 days in Nyaung Shwe is more than enough. thank you anyway. we will try our best. I arrived in Inle Lake on the night bus from Bagan around 5:30am, and the manager, Tin Maung, allowed us to check-in to our room. He then suggested some good itineraries for our 2 days there, and offered reasonable prices for a boat tour around the lake. In addition, he gave us information on reasonable costs of various activities, provided help in booking our flights to Yangon, provided laundry services at cheap prices, and gave us a discount on staying 1 more night. He truly made our stay a pleasant one. The rooms were very clean and are a good size. Breakfast was also good. I’d highly recommend staying here considering the value offered and excellent service. This hotel is in a great location with helpful staff and clean rooms. You can walk to several restaurants in the area and the traditional puppet show which plays every night. 15 mins. walk to the boat dock to catch the boats to Inle Lake. Excellent breakfast. Although the owner of the hotel said the wifi only works in the lobby, it did work in our room as well. Thank you so much. We really appreciate your recommendation & it will provide our job. Good luck to you. 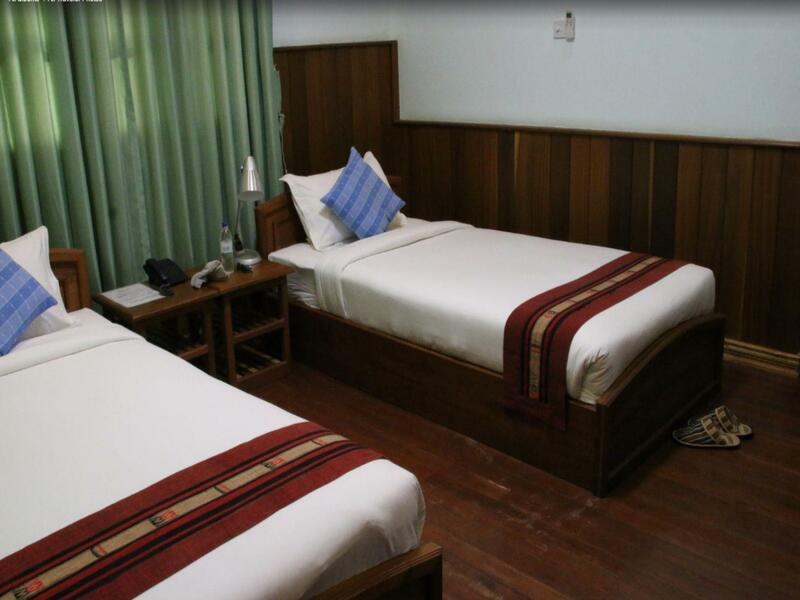 Excellent location, very close to restaurants and bars, 10 min walk to pier for boat rides on Inle lake. Manager is always attentive to customers' needs, offers help and useful advice. Excellent staff. Breakfast is good. Rooms are modern and super clean with all amenities. Only con is sketchy wifi but this happens everywhere in Myanmar. I would stay here again for sure. Many Many thanks. Good luck to you. Very convenient location, 2 minutes from the market and main restaurants Roms OK Excellent breakfast (fruit, eggs, bread, pancakes ...) The owner is doing everything to make sure we had a nice stay (room away from the road, check out at 5pm ...) Really recommendable, We enjoyed our stay! Thank you very much.Good luck to you. Thank you so much that you give so long time to provide our job. Good luck to you. we left a book in the airplane. the hotel staff was very helpful. The airline agent didn't speak English and hotel staff helped us to explain and arranged how we could get the book back. Staff all very friendly and resourceful. We got our boat ride arranged by the hotel as well and the cost was reasonable(one day with special destination 25000khats). Hotel room was clean with a small patio and the location is close to long d bus station. The location was on the Main Street... The staff were agreeable and accommodating. The room had everything we required to be comfortable. The breakfast was the same each day (we were there for three days): toast, egg, lots of fresh fruit, crepe-like pancake(the banana pancake is delicious). The only complaint we might have is that the WiFi was very irregular and unreliable. But consider where you are...in a smallish town in the middle of Burma. Since the minute we arrived everything was perfect. The staff is very polite and Us us welcoming. They toke care of us like we were there family and allways with a smile. Especially the manager Sai, who was so kind and generous during all our 3 days at the hotel. We had a deluxe bungalow for the tree of us, it was spacious, very clean and equipped with all the facilities needed. All in all we had a wonderful stay and I would recommend this hotel to everyone with all my heart. This hotel was a pleasant surprise for us. The owner is very kind and he accomodated all our request always with smile on his face. We arrived early morning at Inle and requested for early check-in, it was a warm welcome for us too. Location wise, you will be at the right place with everything within reach. Place worth the money with excellent service. We enjoyed our stay very much! The hotel staff is extremely helpful and friendly. They arranged for us (even at very short notice) an amazing one-day boat trip on Lake Inle, a nice trecking tour and a night bus. The hotel is located on the main road, so you can walk to restaurants, boats and bus stations. Also, due to avaialibilty of a room an early check-in was possible. Really lovely little hotel with fantastically attentive and helpful staff, the hotel manages to be an oasis of calm just off the busy main street of Nyaung Shwe. We organised the boat tour through the hotel and our boatman was brilliant. Very easy to walk into town and close to some of the best restaurants. The bike hire opposite charges only 1000MMK for the day and it is very easy to ride out of town into the countryside to visit the vineyard, caves, monastery and other villages... would totally recommend doing that as well. Breakfast also great - try the Shan noodle! This hotel is very well located. 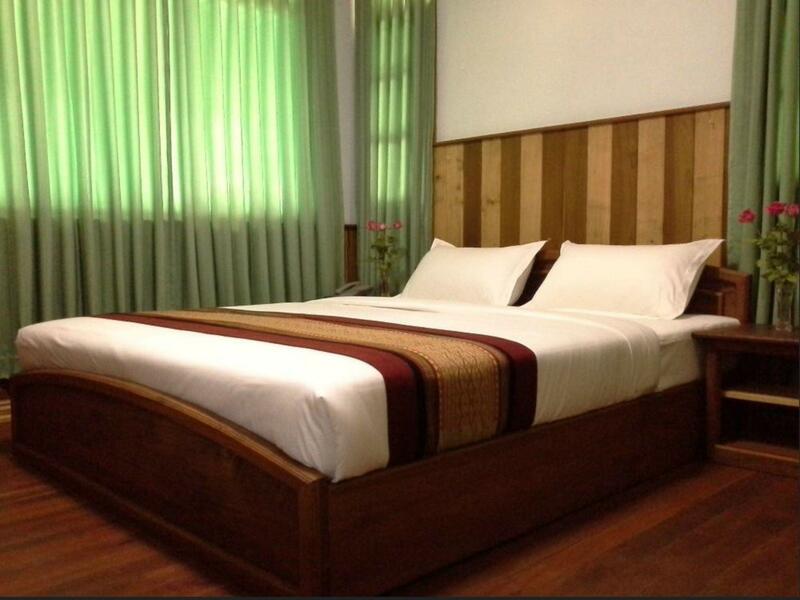 Bedroom and bathroom are very spacious, well decorated , very comfortable. The staff is very helpful. The breakfast is excellent. There really is no garden , but a small terrace outside the room which is nice . The price however is a bit high compared to the standard of the hotel .